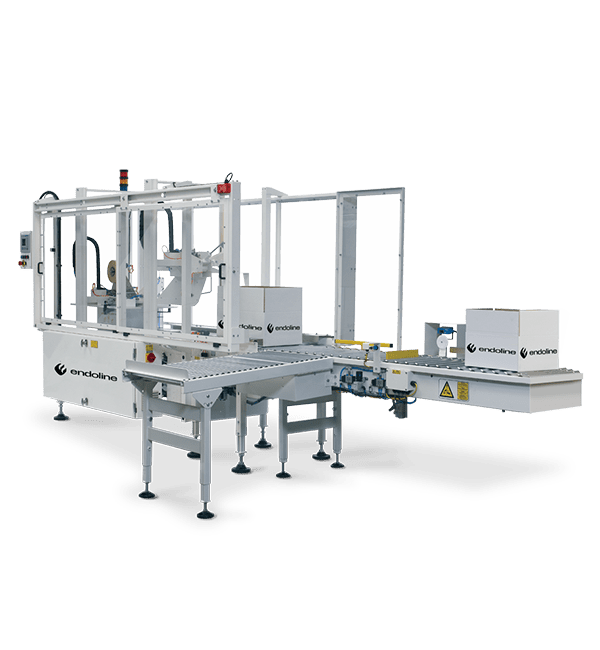 The Endoline type 734 is a fully automatic random case sealer that automatically closes and seals cases with self-adhesive tape. It is the dominant machine of its type in the market and has been installed with major snack and biscuit manufacturers around the world. The type 734 offers a high speed solution using barcode scanning technology to recognise the cases prior to sealing and is very simple to operate and maintain. It has a specially designed unique four column construction to provide added stability and its robust chassis enables the machine to run 24 hours a day, 7 days a week with minimal down time. The type 734 case sealing machine can handle cases between 200-460mm length, 160-500mm width, and 110-570mm height. Up to 20 cases per minute dependant on case size. Mild steel, powder coated white (RAL9010) or stainless steel. This machine will automatically adjust its settings to close and seal 0201 cases throughout the full case size range in any random sequence. This machine can operate on small and large cases at speeds of up to 20 cases per minute. These machines are designed with clear access, simple controls and quick to adjust to size changes. The machines are operator friendly and allow for quick and easy size change, cleaning and maintenance to ensure minimal machine down time. High quality components housed in a robust chassis ensure minimal servicing and enable 24 hour operation. These systems are designed for the rigours of typical end-of-line packaging environments. The Endoline case erector machine range is designed to give you the best possible value for your investment through maximum productivity with minimal stoppage time. All Endoline’s machines are built for 24/7 operation and require little maintenance offering a long life expectancy resulting in a low cost of ownership. Al Thika Packaging is the exclusive distributor of Endoline in the Middle East. Since 1994 Al Thika has been providing a wide range of machinery includes case erectors, case sealers, conveyor systems, case loaders for food, pharmaceuticals and non-food industries in Dubai, Abu Dhabi, Sharjah, Fujairah, Ras Al Khaimah, Ajman, Umm Al Quwain, Al Ain – UAE, Saudi Arabia, Bahrain, Oman and the many other Gulf countries.